Welcome to the second installment of “The Lost Music of 1970’s Hollywood”. The four bands listed rose to prominence in the 70’s selling-out venues but never got around to releasing an album. Through conversations with both private collectors and band-members, we know that music of all four bands survive through demo cassettes, private pressings of 7″ records , as well as reel-to-reels; whether or not the music will actually get released is still unknown. 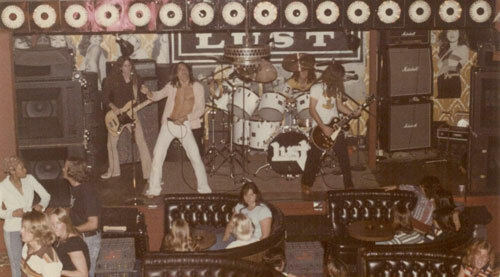 LUST formed in 1970 while the band was still in Middle School and lasted until 1983. The lead guitarist Austin M. Carrino (born October 28, 1956) has preserved all reel-to-reels, cassettes of live radio broadcasts, flyers, newspaper clippings, and photography of the band. (To hear the music of LUST: https://soundcloud.com/austinmcarrino). The first demo was recorded around 1976/77 at the John Thomas Studio in North Hollywood. Three songs were recorded: “Queen Of Diamonds”, “Grains Of Sand”, and “Blue Limousine”. The second demo was recorded in 1979/80 also in North Hollywood. Three songs were recorded: “Lady Fine”, “Roll Away”, and “First Time”. At the height of LUST career, they performed at the Santa Monica Civic Center to 8,000 people, and signed a record deal with Warner Brothers in 1979. Eventually, the band dissolved in 1983 before releasing an album. Keith Deen went on to sing for Holy Terror, eventually passing away in 2012. Liam Jason went on play for Warrior – (1982-1985) and Rhino Bucket (1989-1993). Pictured above, is a photo from Verdugo Hills High School possibly 1974. Austin M Carrino is playing guitar in the white pants, while Frank Galante is playing Bass in black pants. Frank Galante’s Yearbook photo is posted in the upper-left. These are some of the only known photos of Frank Galante from this era. The “Dark Star” session appears to be the first known recording of the Dale Lytle and Dave Raudman together. 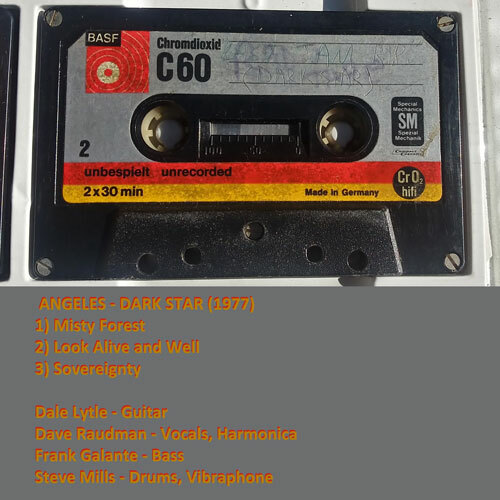 Steve Mills left just before the band changed their name to Angeles, so this recording is absolutely pre-Angeles. 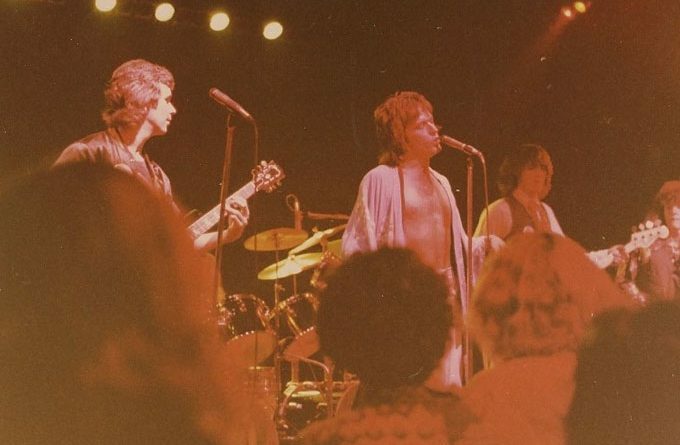 “Misty Forest” and “Sovereignty” are two full songs, while “Look Alive and Well” and “Journey” are surviving song fragments which were cut-off or taped over. The original master-tape, still owned by Dale Lytle, runs thirty-minutes at length. Frank Galante appeared in several demos of Angeles and his genius and talent shine through even in this rough demo. The bass-playing of Frank Galante captures the psychedelic and complex feelings of the late-70’s. 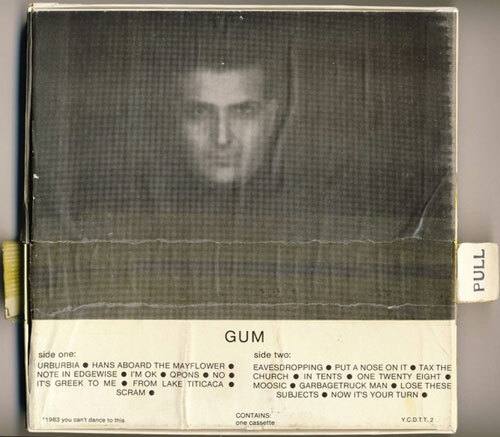 Frank Galante is also featured on several other Angeles bootlegs: “The Second Demo – May 29, 1977”, “The Galante-Harrington Sessions 1978”, and “The Story of Angeles (1976-1979)”. The song “Journey” (which only exists as a fragment) was an aggressive 12-minute medley with no repeating sections; guitarist Dale Lytle says says that up to three different riffs from “Journey” were later expanded into individual songs of their own. Sometime after March 1977, Angeles headlined a sold-out concert at the Tujunga Theatre. 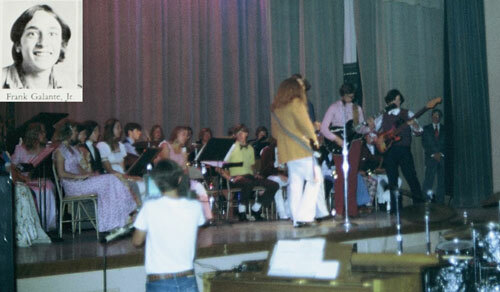 This was the band’s first venue at a proper venue, as their previous five shows were all different High Schools. The line-up for this concert was: Dale Lytle, Dave Raudman, Frank Galante, Jen Nicia Alcivar, and Terrell Hill. 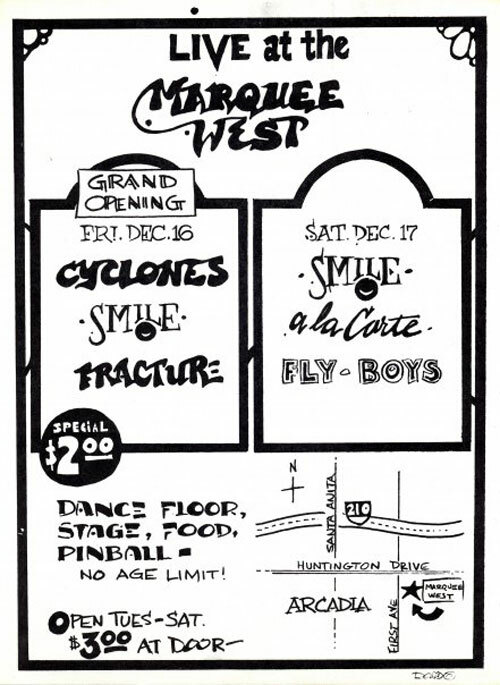 The Grand opening of the Marquee West (located in downtown Arcadia, just off the 210 Interstate Highway, 22 miles east of Hollywood) took place as a two-day weekend event on December 16th and 17th 1977. The venue was converted from a Market Basket Grocery Store; the meat lockers were left as they were used as dressing rooms for the bands. The venue lasted six months: December 1977 to May 1978. The year before the Marquee West opened, sometime around in 1975 or 1976 “The Fabulous Cyclones” spend a few months touring Yugoslavia. The four members were Joe Ramsey on bass, Carl Haasis and Gary Putman on guitars, and Jimmy Volpe on drums; Vocalist Steve Gaghagen was unable to join the tour, so vocal duties were shared by Ramsey and Putnam. The band had to sell all of their equipment in order to afford to get back home. After returning home to the US, the band dissolved. A short time later, three of the members of “The Fabulous Cyclones” simplified their name to “The Cyclones” with a solid five-piece lineup: Joe Ramsey on Bass, Carl Haasis and David Hill on guitars, Brion Costa on drums, and Steve Gaghagen on vocals. 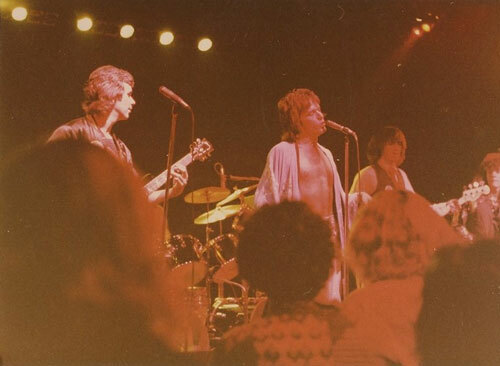 On Thanksgiving Day, 1977, The Cyclones opened for Journey at the Golden West Ballroom in Norwalk. The Cyclones released one 7″ record in 1977: “An Audition/Canada” Brion Costa estimates that the print-run was between 250 to 500. The band changed their name to “The Item” and made their musical debut at The WoodSound on July 28th, 1978. Joe Ramsey would go on to create Dread Zeppelin. Fracture was active from April 1975-August 29th, 1979. They were part of the explosive Pasadena Music Scene, occupying one of three rehearsal spaces in the basement of Pasadena Athletic Club. In 1976, while playing Pasadena College, David Lee Roth entered the sound booth in order to better watch Fracture perform. In 1979, Fracture released a private-pressing of 500 7″ sleeved records: “I’ll Never Give Up / Tell Me”. Peter Catham on Vocals, Robert Bachelor on Guitar, David Nelson on Bass, Mark Tusler on Drums, and McCrea Adams on Keyboard. 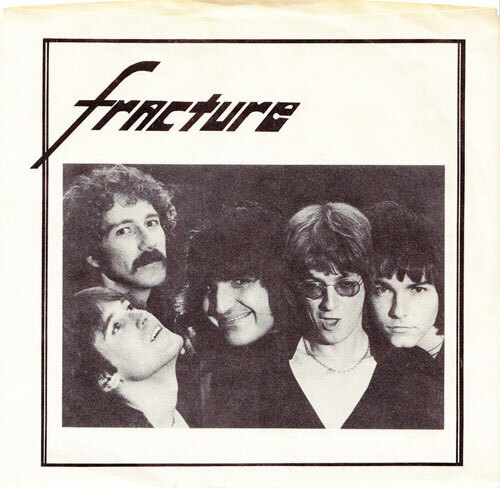 Fracture played extensively during their four years as a band, and were considered a staple of the late 70’s Hollywood scene.